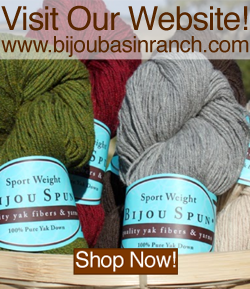 Bijou Basin Ranch: Summer Specials & Millends - Get 'Em While You Can! Summer Specials & Millends - Get 'Em While You Can! Just in time for your summer knitting, we've got a special deal on Breezy Bolero kits - over 45% off for the lucky three people who snap them up in our online store! Each kit includes 5 skeins of Mauve Roslyn yarn, a blend of 90% Cotton and 10% Cashmere that's oh-so-soft and perfect for warm-weather projects. There is enough yarn to make any 1 of the 6 available sizes (XS through 2XL) in the Breezy Bolero pattern by Marly Bird...but you'll have to act fast, because when they're gone, they're gone! Click here to purchase a Breezy Bolero kit online. If you miss out on the Breezy Bolero kits, fear not: there are more deals to be had with our once-in-a-blue-moon Mill End Sale! 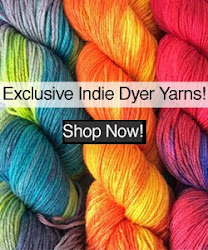 We've got some incredible deals on large quantities of premium Tibetan Yak yarn - each bag weighs at least a half-pound and is comprised of several "Mill Ends" or short skeins (more on that in a second). 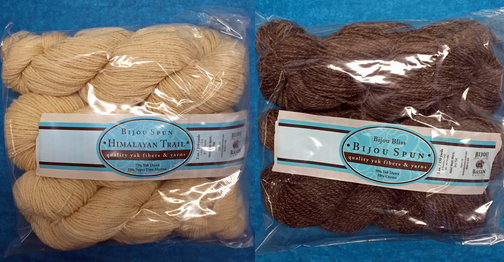 This is a great time to save big on natural colors of Bijou Bliss (our yak and corm blend), Himalayan Trail (our yak and merino blend), and Tibetan Dream (our yak and nylon blend sock yarn)! You're probably wondering what we mean by the term "Mill End." Here is a short explanation: each yarn is sent to us on cones from the mill; from there, it is measured out and broken up into individual skeins. When skeining the yarn, we always end up with lengths of yarn on the cone that is not enough to make a full skein - so they are tossed into bins marked 'shorts.' These shorts are then sorted into bags by weight until we have enough to sell in a "Mill End Special." Each bag weighs at least one half pound and is comprised of multiple short skeins that you will need to splice together. A bag may have as few as two skeins or it could contain twenty-two skeins....there is an element of surprise involved with our Mill End Sale! To make up for this inconvenience, we discount these bags of yarn significantly: 50% off or more, to be exact! If you've been dreaming of a sweater quantity of yak yarn and don't mind weaving in a few extra ends, this sale is for you!